For many years, my maternal great-grandmother taught in a one-room Amish schoolhouse. That meant teaching all of the subjects to children in grades one through eight. No small task! In a stroll down memory lane, my mom recently mentioned how much she enjoyed visiting that schoolhouse. She has keen memories of the simple wooden desks, black boards, and wood-burning stove. Grandma D, as we called her, also kept her piano in the schoolhouse and frequently played for her students. The rickety outhouse made quite an impression, too. Apparently, Grandma D often shared the fruits of her “homework” with her Amish students. One such treat was her rhubarb sauce. My mom vividly recalls a wide bed in her grandparents’ backyard dedicated solely to rhubarb. It ran the length of the clothesline–that’s a lot of rhubarb. In a spring ritual, the celery-like stalks would be chopped and then cooked down in several enormous pots, all destined for the sweet, rose-colored sauce. As a kid, I simply thought of rhubarb as pink applesauce. On its own, rhubarb is quite tart and requires some form of sweetener to make it palatable. As an adult, I began adding strawberries to my sauce. The natural sweetness of the berries allows for less added sugar to temper the tartness of rhubarb. And like peanut butter and jelly, strawberries and rhubarb just belong together. 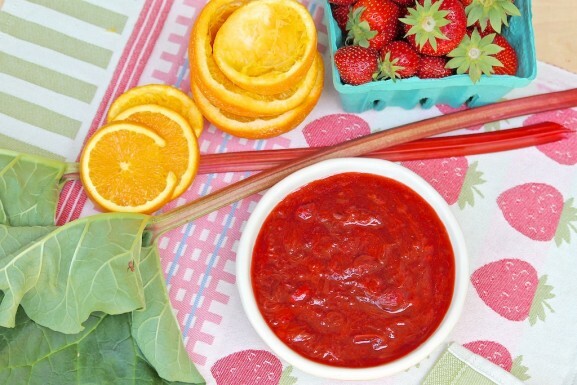 Aside from eating by the bowlful, there are multitudes of other ways to enjoy this sweet-tart sauce. We’ve enjoyed our fair share drizzled over vanilla ice cream. Angel food and pound cake make tasty bases, too. Stir some into plain Greek yogurt or your morning oatmeal. Or spoon the sauce over whole-grain toast that has been spread first with mascarpone or cream cheese. Similarly, make a springy bruschetta with a base of goat cheese and a drizzle of aged balsamic. For more savory options, create a chutney for grilled chicken or pork by adding a splash of balsamic vinegar to a portion of the sauce. As an added bonus, both the finished sauce and the uncooked stalks freeze extremely well. In the case of the stalks, simply chop into one- to two-inch-long pieces and freeze on a baking sheet. Once frozen, transfer to a zip-top bag or other airtight container. No need to cook or blanch first. That way, a variety of delicious rhubarb treats are within easy reach all year round. In a medium saucepan, bring the rhubarb, sugar, and orange juice to a boil. Reduce the heat, add the strawberries, and simmer for approximately 10 minutes or until the rhubarb and berries break down. Remove from the heat and cool completely before storing in the refrigerator or freezing for later enjoyment. 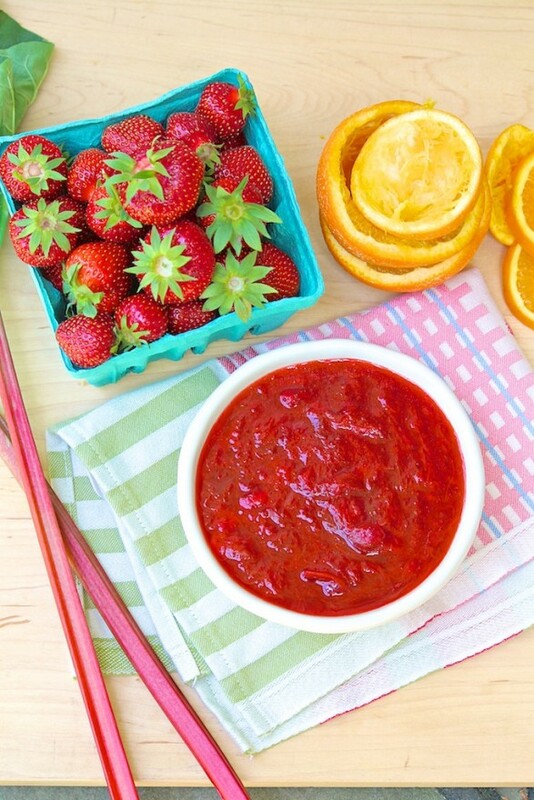 Strawberries and freshly squeezed orange juice add natural sweetness and incredible flavor to tart rhubarb in this quick, versatile sauce. A 2012 picture of a refreshing dessert. 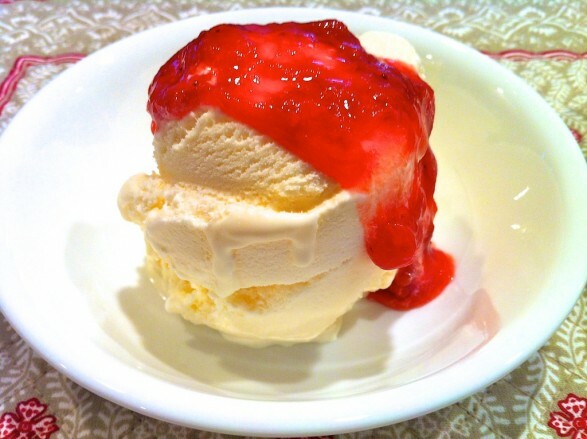 Simply spoon the sauce over vanilla ice cream or frozen yogurt and enjoy. 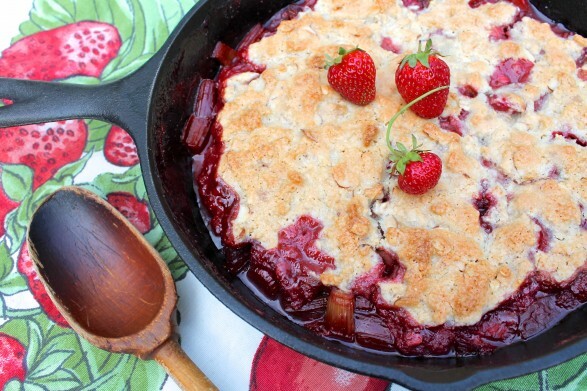 Strawberry Rhubarb Cobbler — A delicious almond-oat topping makes this a family favorite…gluten-free, too. I was wondering how long this will keep and whether you know if it would freeze well. It will keep in the fridge for at least a week and freezes beautifully. I freeze a few containers every year! Who knew that 4 ingredients could taste so good? I never cooked with rhubarb before and got some in my CSA basket this week. Tried this recipe after seeing it in the newspaper and we have eaten it on ice cream, in your parfait recipe, and by the bowlful. Kids love it as much as the adults. Will definitely make again. Thank you!! I’m so happy your first time cooking with rhubarb was a success, Jan. Love it when something so easy is so good! I made a batch this week….absolutely delish! Oh my goodness, sooooo yummy! I’ve lots of strawberries and rhubarb in the garden and wanted to find something different to make with them and this fits the bill! This will be so good to have in the freezer for that taste of summer in the winter months, thank you! Wonderful news, Clare! I’m delighted it’s a hit. I freeze this sauce regularly and it keeps so well. Thanks for your thoughtful feedback and enjoy! Can I freeze this sauce and use it later for a pie? Thank you, Rose! I haven’t used this for pie–you may find it to be too thin–but it does freeze very well.